A linebackers first priority is to stop the run. Linebackers must be able play fast, react fast, be aggressive, and have a desire to hustle to the ball carrier every single play. Linebackers must be able to play in space and in crowded box situations. They must master the art of block destruction and tackling. They will have to deal with offensive linemen and lead blockers every single play. In addition, linebackers are critical when it comes to pursuit and containment. Linebackers must be able to flow to the ball carrier inside to out. They take away cutback lines and play a big roll in preventing big plays. 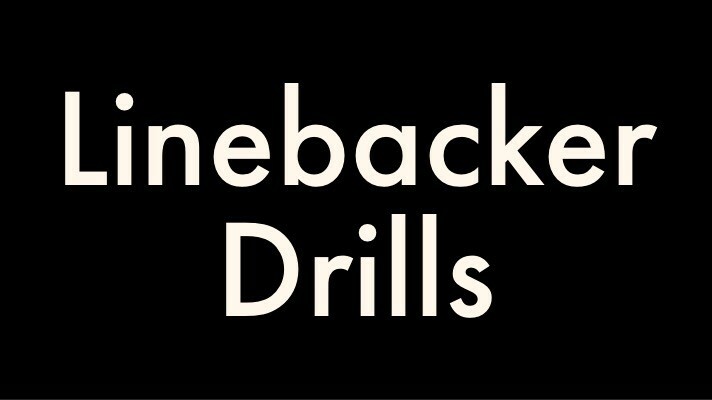 Here are the best linebacker drills for youth football. Playing linebacker doesn’t just require them to stop the run. They must be able to play coverage. They will be called on to cover tight-ends or even receivers. Linebackers should be your best athletes as they will be required to do a variety of different task. We always build our linebacker corps from the inside to out. Our best overall linebacker is in the middle, our best athlete is our field linebacker and our next best linebacker is our short side linebacker. In order to play linebacker you must be able to beat blocks. We work a ton on a technique we call ‘shock and shed’. This is a technique that our linebackers use to deliver the blow (shock the blocker), shed the defender, and go make the tackle. There are several youth football teams that do not work enough on block destruction. Almost every linebacker drill we do will require our linebackers to have to beat a block. The shock and shed technique is great for inside linebackers who will almost always have offensive linemen trying to block them. Our outside linebackers will dip and rip through blocks more as they are primary contain players. This video shows you a great linebacker drill progression. They do several drills that work multiple techniques like agility, block destruction, and form tackling. The past two seasons we have implemented USA Football’s Shoulder Tackling System. We like shoulder tackling and it is something we now have a good understanding on how to teach it. Shoulder tackling is great because it takes the head out of the tackle and forces the defender to use his shoulder pads (what they were designed to do) rather than their helmet. Shoulder tackling has worked well for us and we look forward to teaching shoulder tackling again this upcoming season. There are several non-contact drills that can be implemented in practice. You can utilize blocking shields, sleds, and tackling dummies to minimize the amount of live contact you have during the practice week. With many leagues limiting the amount of time you can execute live tackling drills, these non-contact drills are more important than ever. Yes, linebackers will have to tackle in space! Most tackles occur with the linebackers coming on an angle. Taking a good angle/path to the ball carrier is just as important as use the proper tackling technique. The tap the hip linebacker drill is an excellent drill that will teach your linebackers how to take good angle to the ball carrier. We do the tap the hip drill with our linebacker on a regular basis. This is a great coverage drill as it teaches your linebackers how to have active feet and it teaches them how to use leverage. It’s tough covering a tight-end or running back in space but this drill will help. This is a great drill because it will teach your linebackers how to recognize pass and react. Linebackers have to read and react every single play, so it’s important that you teach your linebackers how to react. The linebacker position is challenging because a linebacker has to worry about defending the run, pursuing the ball carrier, and being involved in pass coverage. This drill will also teach your players how to open up their hips and drop into their zones. It will teach them how to step for run and open hips up and drop into their zone when the offense execute a play-action passing play. Linebackers are the best overall athletes on the field. They have a combination of size, speed, agility, and strength. Linebackers have to be able to react fast and use their athletic ability to get to the ball carrier or defend against the pass. This agility drill is one of the best drills because it forces the linebackers to open their hips and run back, forward, and laterally. This is a drill that will develop hip fluency, agility and explosiveness. This drill is a high tempo drill that will really condition your athletes. The pursuit drill is the one of the most important drills in football. It’s a drill that will teach your linebackers how to take good angles to the ball carrier. It will also instill the mentality that they need to get to the ball carrier quickly. Zone drops, man coverage, pursuit angels, blitz/slants, and reaction are all practice during the pursuit drill.